Hello everyone. 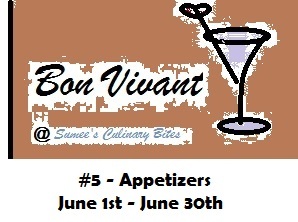 Welcome to another addition of Bon Vivant Moments. This month we will indulge in the appetizers. They are the first dish you would serve at the meal. Appetizers start the tone for what's going to follow in the main course. So all this month of June we are honoring this humble starters. ~ Blog post should be in month of June. ~ Two old posts are allowed, if re-posted again in June. this is June event but your rules state post should be in May??? First time here.. came from Chef Mireille's blog. Will post my recipes soon.. Stumbled upon your blog & saw this event happening. Submitted two of my recipes. Happy hosting.